There’s a Bentley GT concept car at CES 2012 to demonstrate QNX CAR 2.0 platform that provides dual screen support with the dashboard and an infotainment display for the automotive industry. Under the hood, the platform features TI DLP technology, and TI OMAP5 and Jacinto processors running QNX Neutrino RTOS. Texas Instruments and QNX uploaded a video demo of the concept on YouTube. They explain that they switched their platform from HTML5 to native OpenGL for optimal performance using Storyboard Suite from Crank software, and they can now show 3D maps smoothly on the platform. The 1080p user display is curved to be more user friendly (better touch angles). You must have certainly heard about touchscreens before, but maybe never heard about “pretouch”. Pretouch is a feature of the system that detect when you hand comes close to a control virtual and pops up a virtual menu. The dashboard shows virtual instrument clusters, that shows the tachometers, and other car system information, as well as directions if you are using GPS navigation. The system comes with standard features such as media player, climate control, etc.. as well as a full duplex video conferencing system with 7kHz audio. In the last part of the demo, they showed that you can get information and control your car with your smartphone, and open/close windows, open the doors, and even horn, although they did not dare to demonstrate the latter at CES 2013. 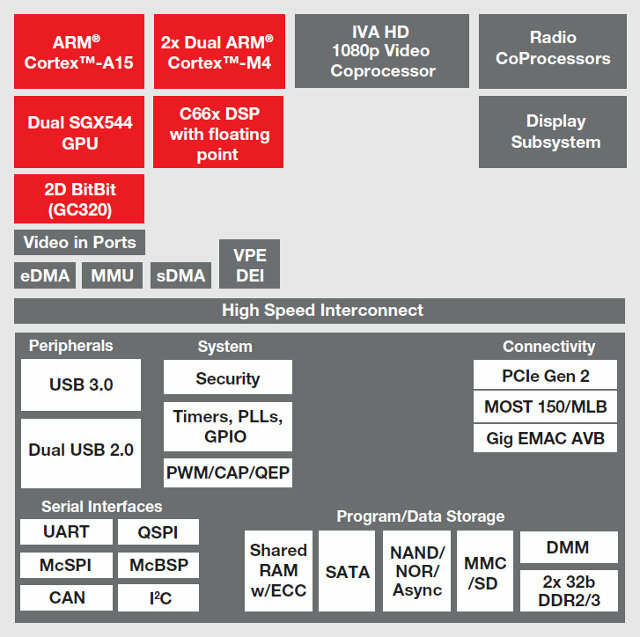 OMAP5 Jacinto 6 processor (DRA74x) is the latest automotive SoC by Texas Instruments. Jacinto 6 is based on the OMAP5 platform, and features 2 ARM Cortex-A15 cores, multiple Imagination Technologies POWERVR SGX544-MPx graphics cores, and adds TI C66x DSP for software defined radio and advanced audio processing. High-definition surround view cameras, multiple concurrent HD displays, USB 3.0, PCIe2, and SATA are all supported by this SoC, and it also adds automotive peripherals such as CAN, MOST Media Local Bus (MLB), Ethernet AVB, PCI Express and dual external memory interfaces. QNX, Linux, and Android are supported on the platform. The DRA74x “Jacinto 6″ processor will sample in mid-2013 and is expected to be available for production by the H2 2014. You’ll need to be an “high-volume automotive manufacturer” to buy it though. You can get more information by reading QNX CAR 2.0 product brief and TI Jacinto 6 technical brief.